With the death of Pablo Escobar last season, things are taking a huge turn in "Narcos" Season 3. While the first two seasons concentrated on the rise and eventual fall of Escobar's Medellin Cartel, Season 3 takes it to one of their rivals the Cali Cartel and its leader Gilberto Rodríguez Orejuela. Last week, Netflix honored the national and international talent from "Narcos" in a stunning event where the whole cast took the opportunity to celebrate and bid farewell to Colombia. 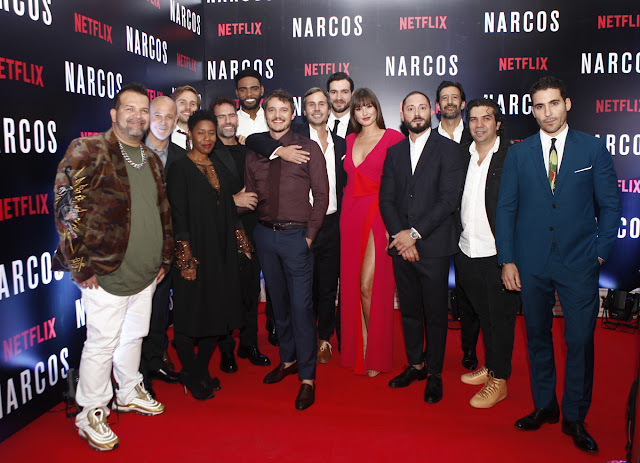 Among the guests were international stars Pedro Pascal, Miguel Ángel Silvestre, José María Yazpik, Francisco Denis, Michael Stahl-David, Matt Whelan, Matias Varela, joined by Colombian cast members Taliana Vargas, Julian Arango, Sebastián Eslava, and director Andi Baiz among other Colombian celebrities. If you haven't watched "Narcos" yet, you should. All the seasons and episodes are now available for viewing via Netflix. About Netflix: Netflix is the world’s leading internet television network with 104 million members in over 190 countries enjoying more than 125 million hours of TV shows and movies per day, including original series, documentaries and feature films. Members can watch as much as they want, anytime, anywhere, on nearly any internet-connected screen. Members can play, pause and resume watching, all without commercials or commitments.